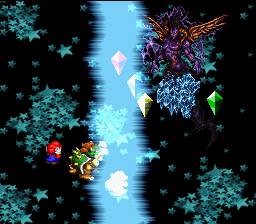 Storm is an electric attack found in Super Mario RPG: Legend of the Seven Stars. It targets a single character in the party with a long, light-blue electrical column the length of the screen. Its damage is usually medium to high. It can be only used by Boomer, the Earth Crystal, Zombone and Forkies. However, an unused enemy named Mastablasta can also use this move. This page was last edited on April 9, 2019, at 16:17.